My family loves this fun spin on hearty meatloaf. This recipe makes 120 muffin tin meatloaves which freeze wonderfully. That means my family of ten gets about 4 meals from this mini meatloaf recipe. Serve with a cup of applesauce or cottage cheese, also fresh garden pepper slices or carrot sticks! Special Note: you can also stuff various extra veggies into your mini meatloaves. Think shredded carrots, diced mushrooms, colored peppers, and more! Mix all above ingredients in big mixing bowl. Here’s my Amazon affiliate link for my favorite 30 qt mixing bowl that is perfect for mixing up large batches! Once the meatloaf minis have safely cooled place up to 12 in a flat Ziploc style gallon freezer bag. 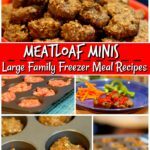 When you’d like meatloaf minis for a family lunch or dinner just set the desired amount out into your refrigerator the night before or morning of the day you’ll need them. Warm them in your microwave for 1 to 2 minutes. Cooking time will depend on how many you’re heating up at one time and microwave temps.